The U-shaped kitchen design is a popular option for interior designers, kitchen contractors and homeowners alike. The reason for its popularity comes from its efficient design and functionality. The U-shaped kitchen design is a popular option for interior designers, kitchen contractors and homeowners alike. The reason for its popularity comes from its efficient design and functionality. 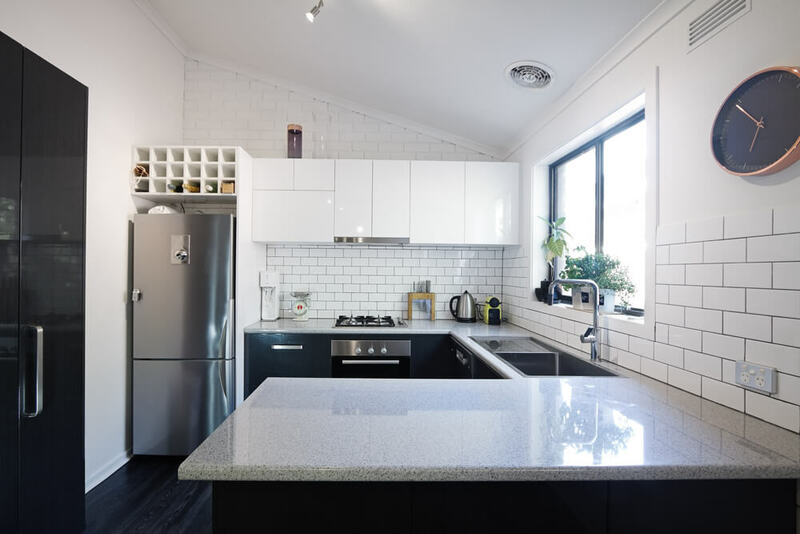 A U-shaped kitchen is installed along three walls, thus creating the opportunity for the ideal triangular working space and uninterrupted counter top runs. And by creating that perfect working triangle additional counter space is made available on adjacent walls. In case you were wondering, the working triangle consists of the area between the fridge, stove and sink. 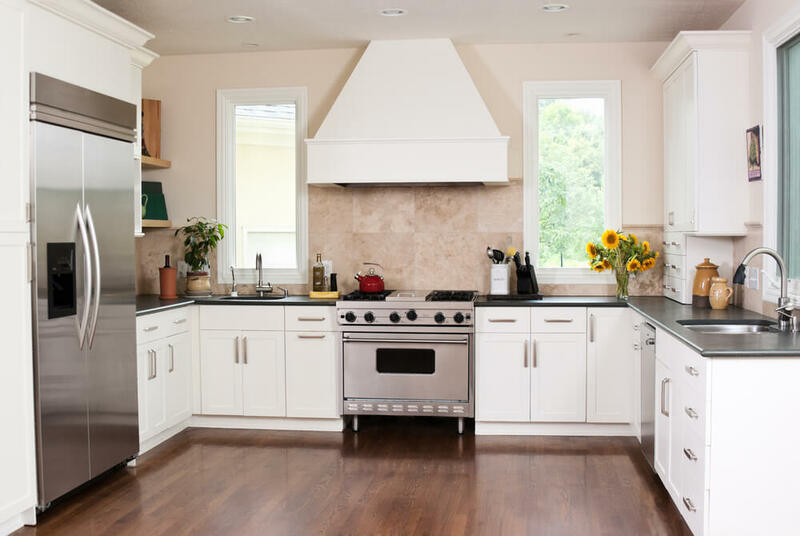 These areas are the often the most used in a kitchen and should be located close to each other. While a U-shaped can work well in kitchens of all sizes, the ideal width for this kitchen layout is 10 to 18 feet. 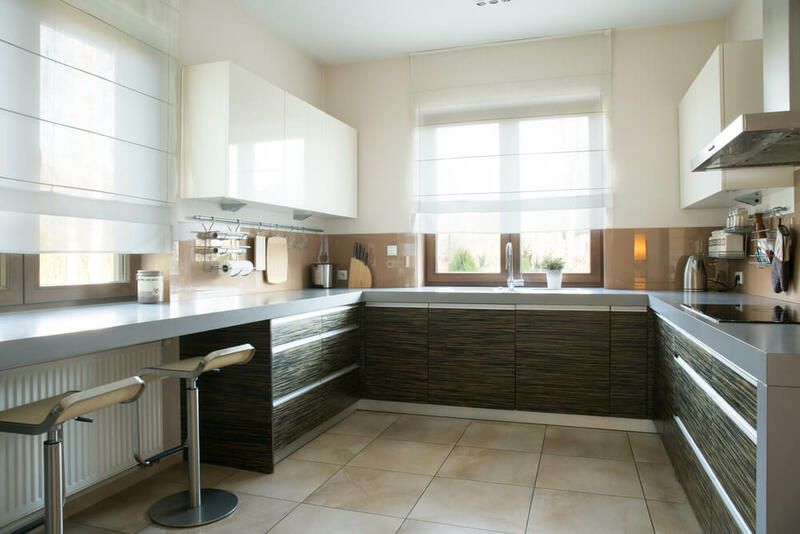 A kitchen will lose its flow and efficiency if the space is too narrow. 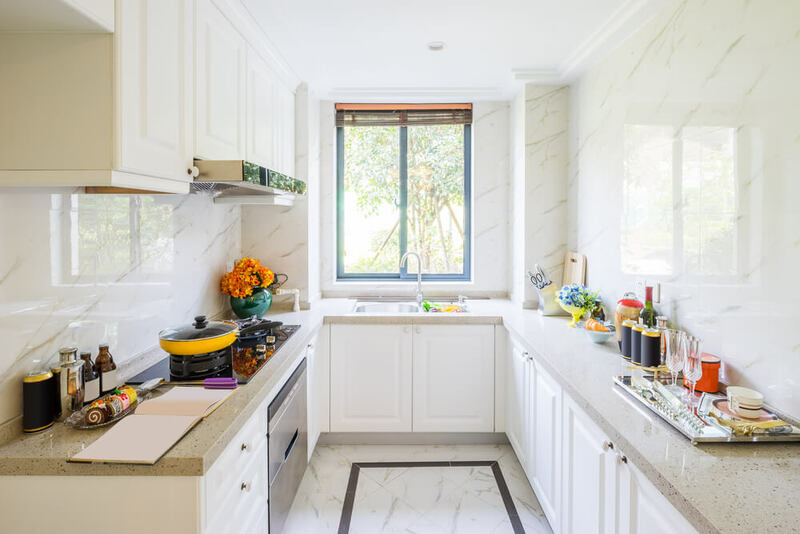 As well, if the space is too wide, and an island isn’t added into the equation, the distance between the counter tops will make kitchen work cumbersome. A U-shaped kitchen can be made even more efficient by installing the fridge outside the “U”. This ensures that the fridge does not take up valuable counter space. Another way to increase the efficiency of this layout is to add an island. However, this will only work if your kitchen has sufficient width. 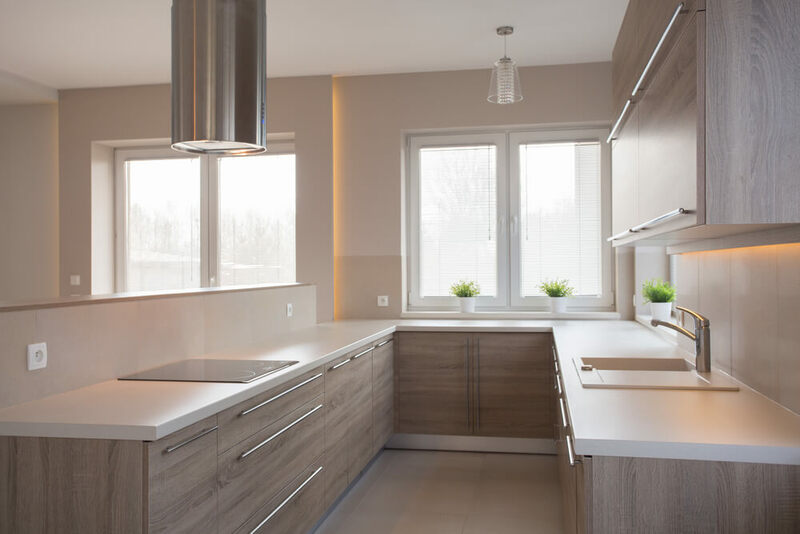 A kitchen design company or contractor will be able to let you know if this option is feasible for you. If it is then there are a couple options for the layout of the island. You can install one that is designed to provide additional work space without providing a place for dining. As an alternative, an island/breakfast bar with seating set on the outside edge of the “U” will accommodate a place for friends and family to enjoy a meal. 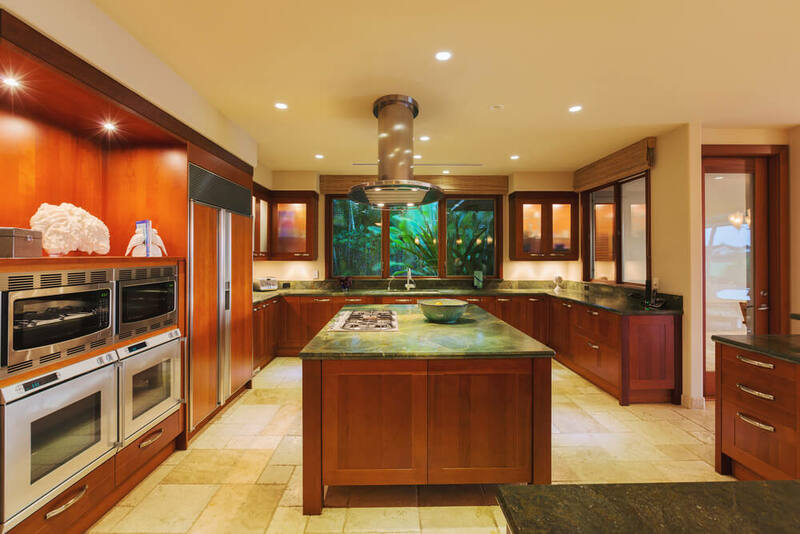 However, you may not need an island as U-shaped kitchens are known to incorporate a peninsula. A peninsula can be used to fulfill a variety of kitchen functions. 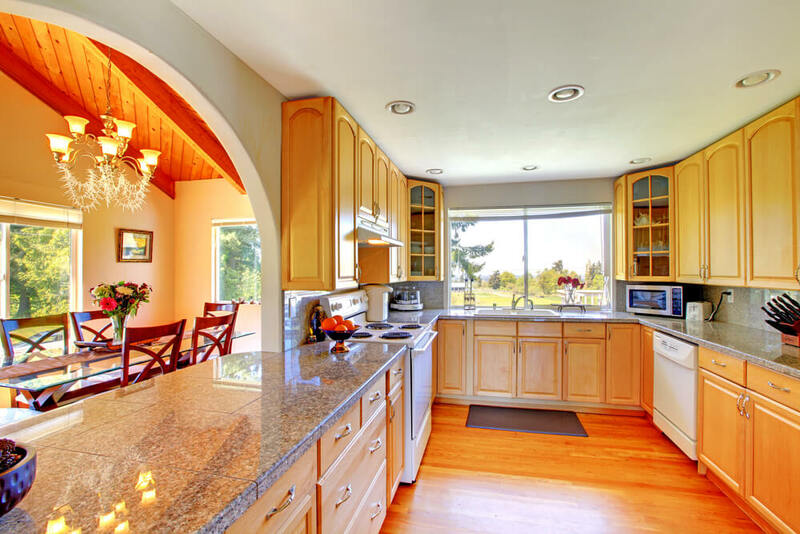 If counter top overhang is installed on the outside edge, it can serve as a breakfast bar. The peninsula also offers the cook an opportunity to engage with those outside the kitchen. 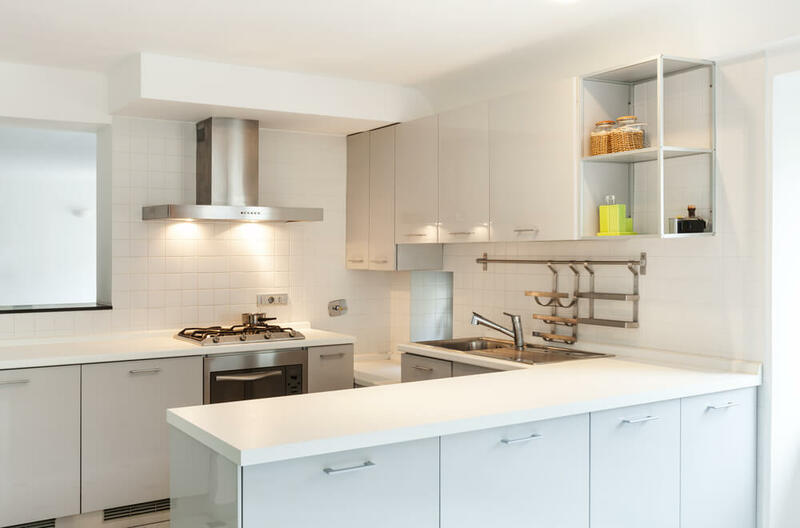 Should you consider a U-shaped kitchen layout? This layout is idea for multi-cook kitchens. By providing three separate working areas, multiple cooks are able to maneuver and prepare meals in tandem without encroaching on the other cooks space. 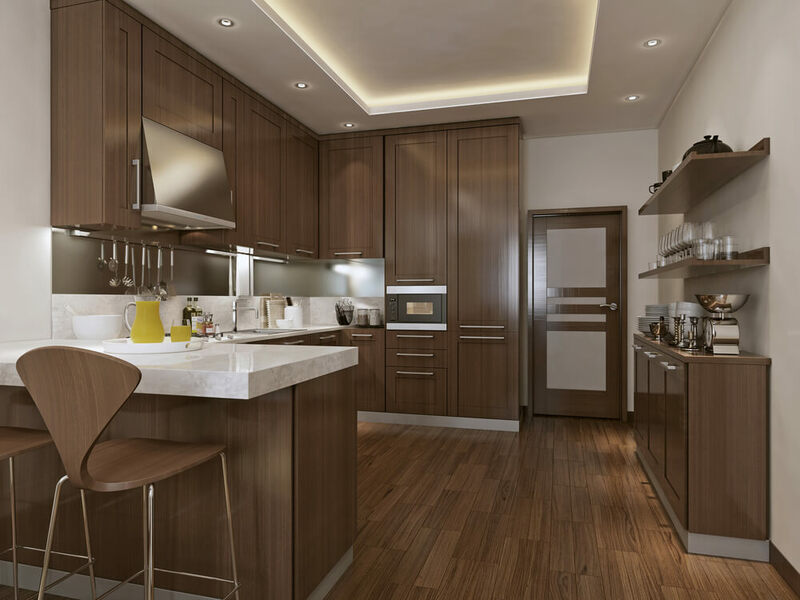 The design is also ideal as you will not have to deal with thru-traffic which can be a problem in open concept kitchens. 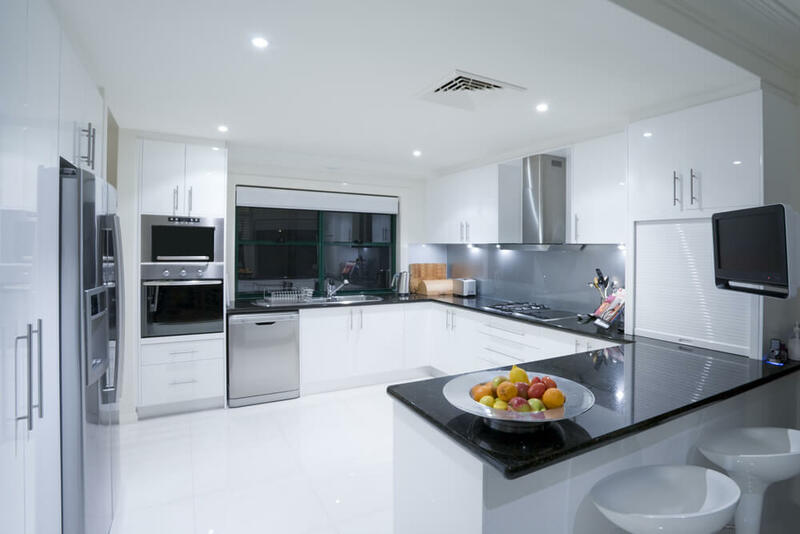 If you are considering the installation of a U-shaped kitchen or how to improve your existing kitchen layout, check out the stunning kitchens below. 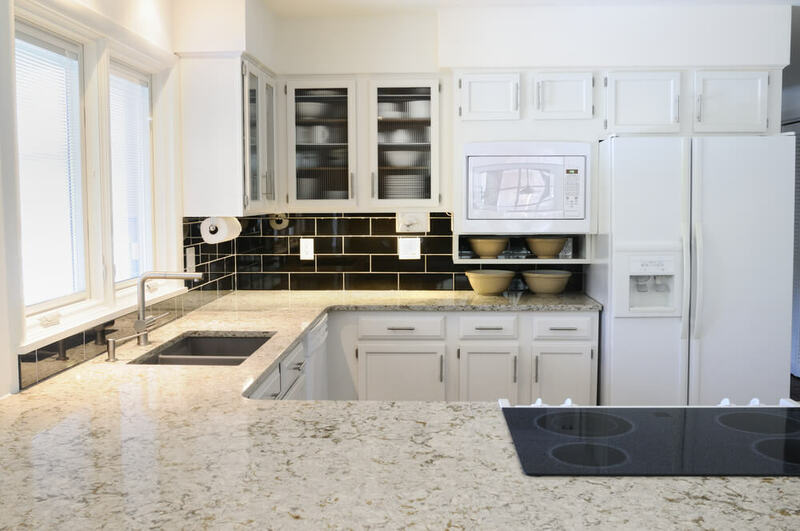 You are sure to find a few that meet your design style and vision for your kitchen. 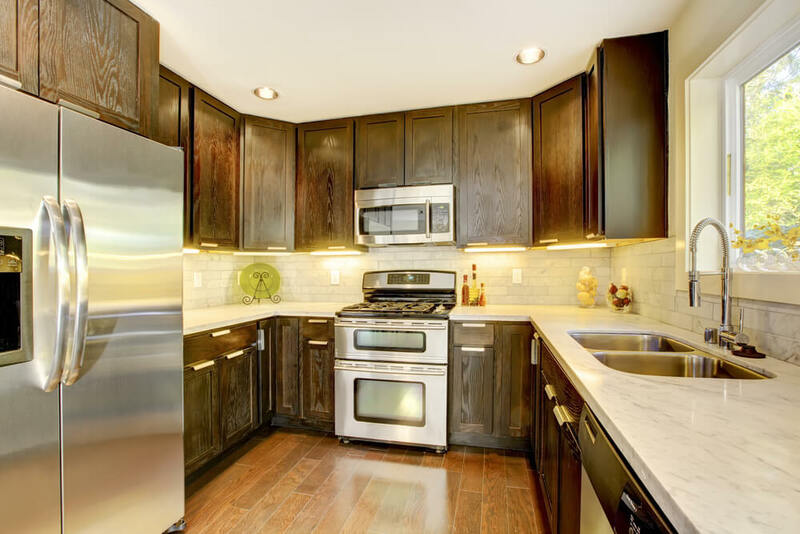 This u-shaped kitchen features cherry wood cabinets accented by brushed nickel hardware. The width of the space is ample enough to provide room for a spacious island as well. 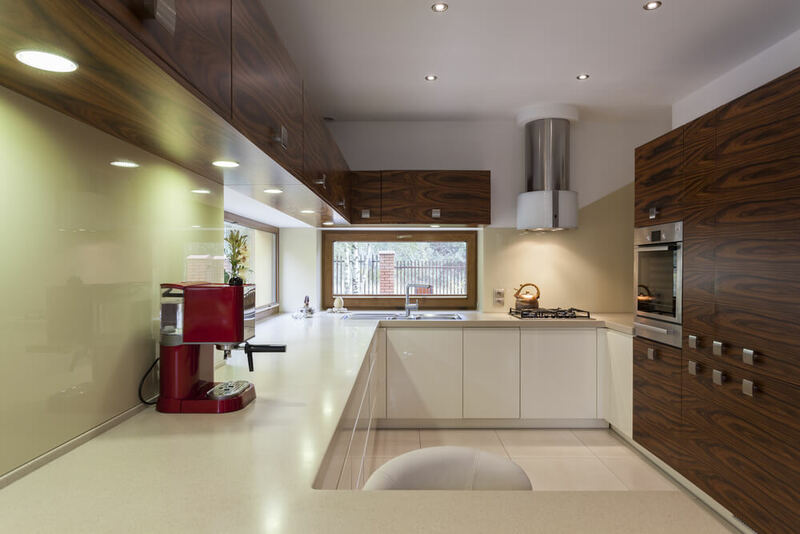 This modern kitchen is designed to take advantage of the space available by using all three available walls. 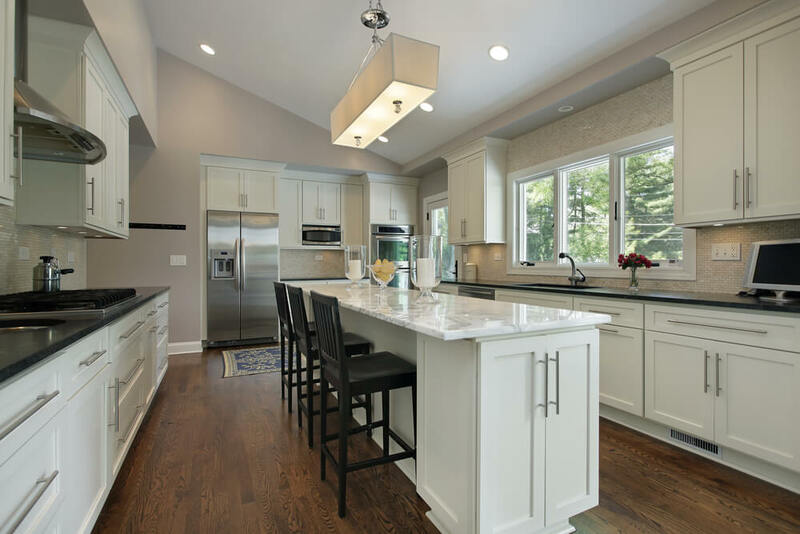 A peninsula with counter top overhang provides the ideal place for a breakfast bar. This u-shaped kitchen features plenty of storage space. 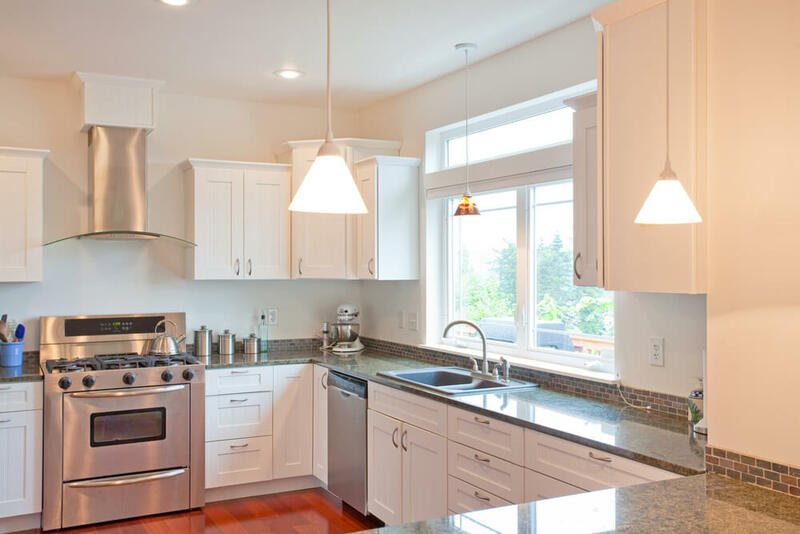 A bi-level peninsula provides a spot for kitchen prep work and to enjoy a cup of coffee. 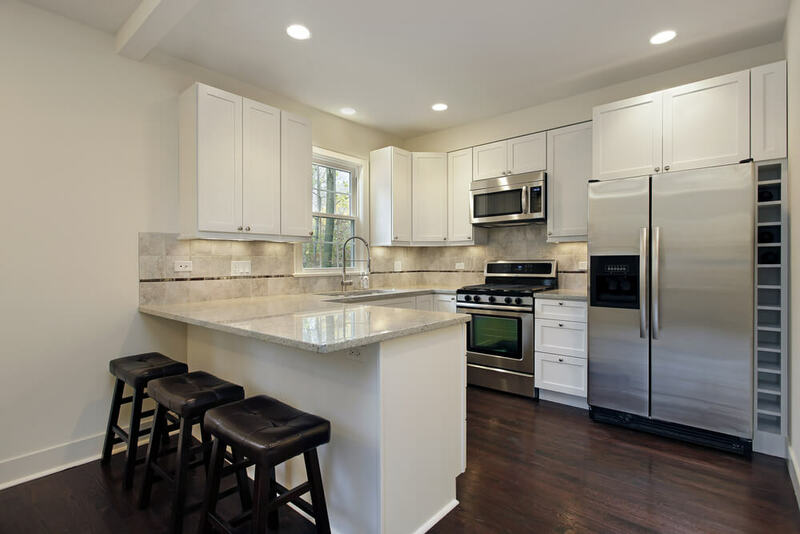 This bright and airy kitchen features Shaker-style cabinetry and solid stone counter tops. 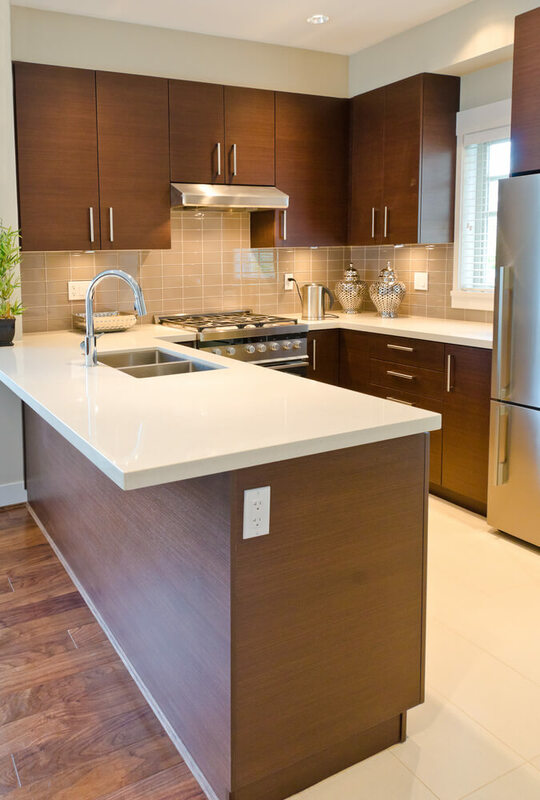 Stainless steel and nickel coordinate perfectly with the crisp white cabinetry. 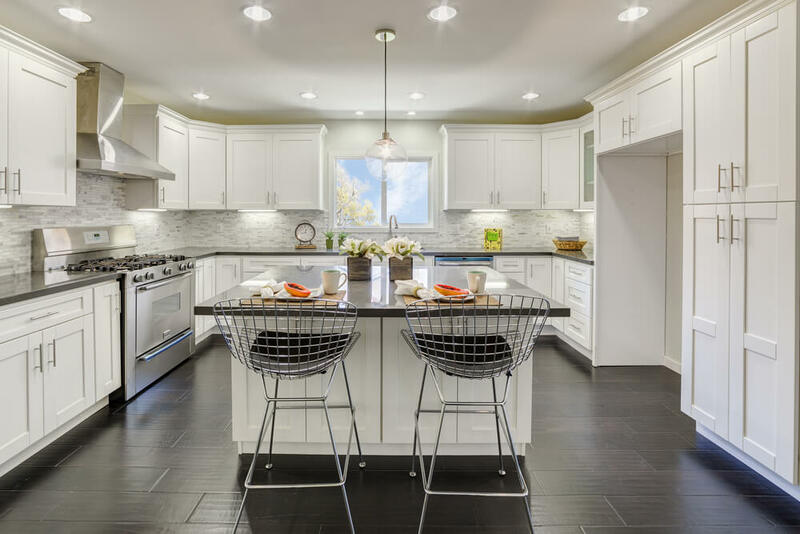 This modern kitchen features white cabinetry and contrasting glossy, black Subway tile. An under mount sink, located in front of the window, allows one to look outside while washing the dishes. 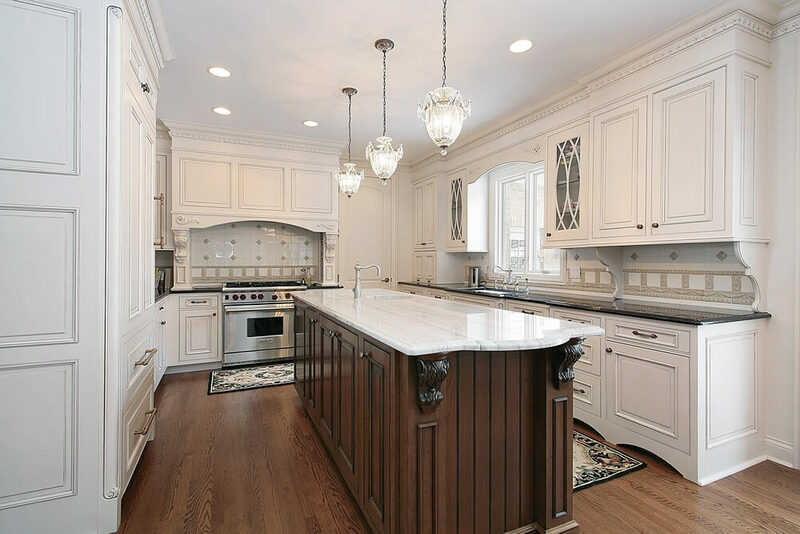 This classic kitchen features Shaker-style cabinetry and custom door covers for the dishwasher and fridge. This helps to create a seamless flow throughout the space. This u-shaped kitchen is designed with features such as two sinks, as well as a custom range hood. A pair of windows flank the kitchen range and fill the space with lots of natural light. The the marble subway tile and solid surface counter tops are an elegant contrast against the dark wood cabinetry. The u-shaped design provides efficient access to the kitchen’s appliances. 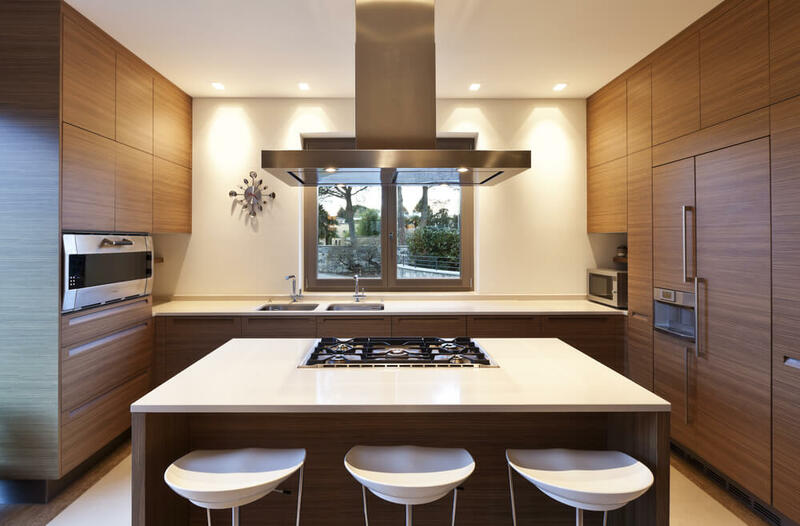 This modern kitchen is designed with sleek, flat-front cabinetry and a glossy, tile back splash. The peninsula, outfitted with a breakfast bar houses a stainless steel, under mount double sink. This kitchen is centered around the large island/breakfast bar. 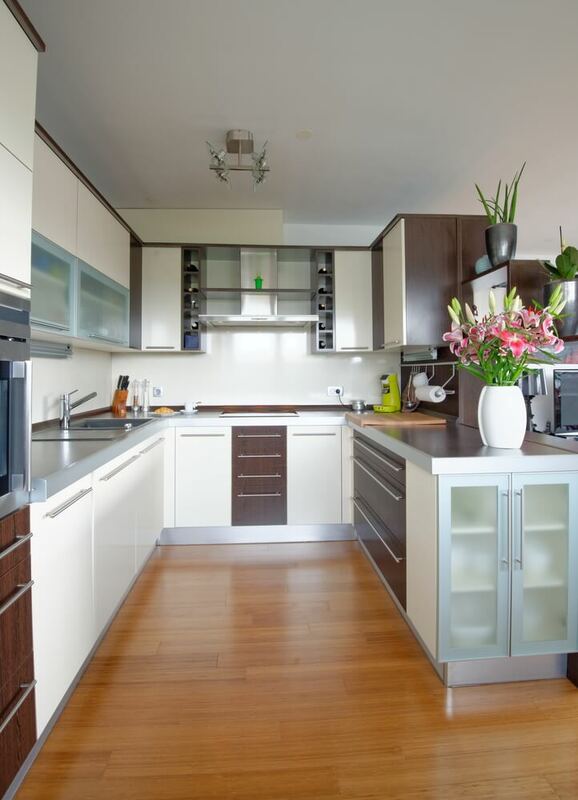 Flat front cabinetry and minimal hardware ensure that the space stays clean and clutter free. 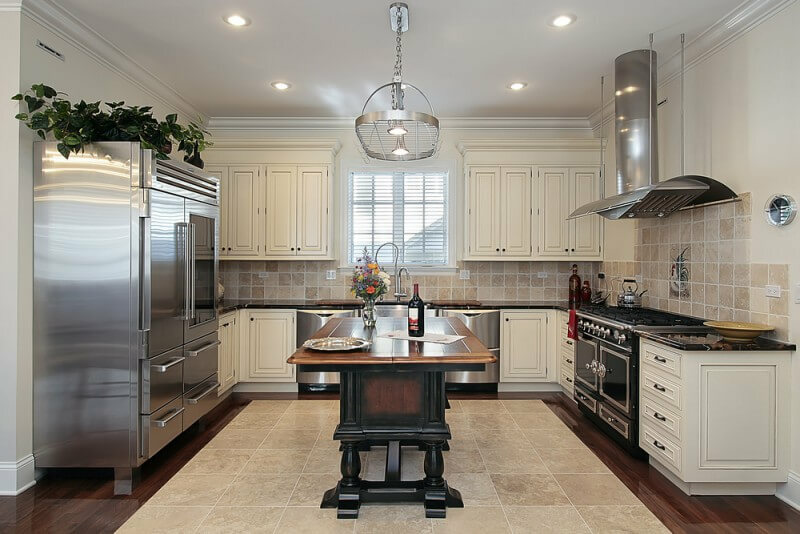 This inviting kitchen features white cabinetry accented by nickel cup pulls and knobs. The golden hardwood floor and bead board walls add texture and interest to the space. 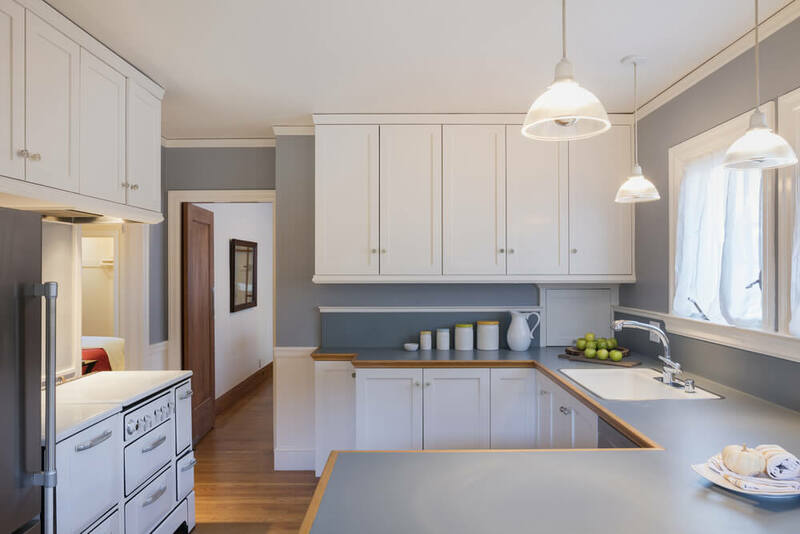 The white wall color and peaked ceiling provide a dramatic contrast against the black, Shaker-style cabinetry. 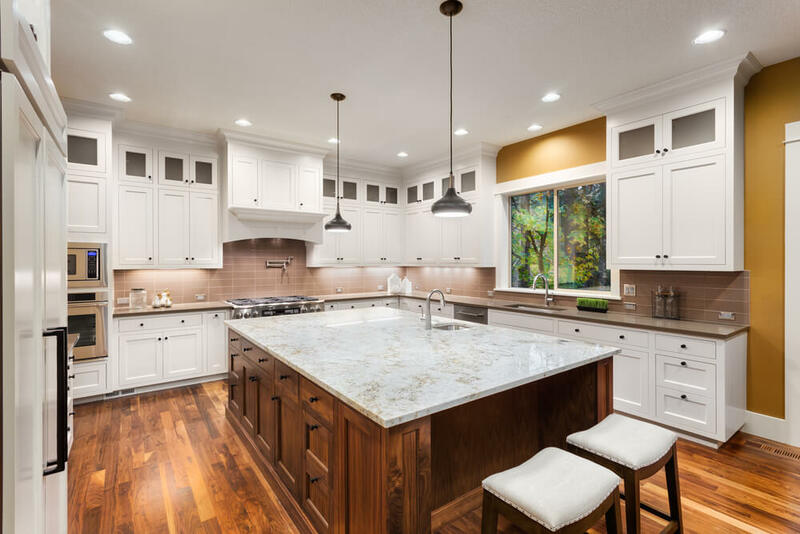 Glass pendant lights hang above the island providing additional task lighting. 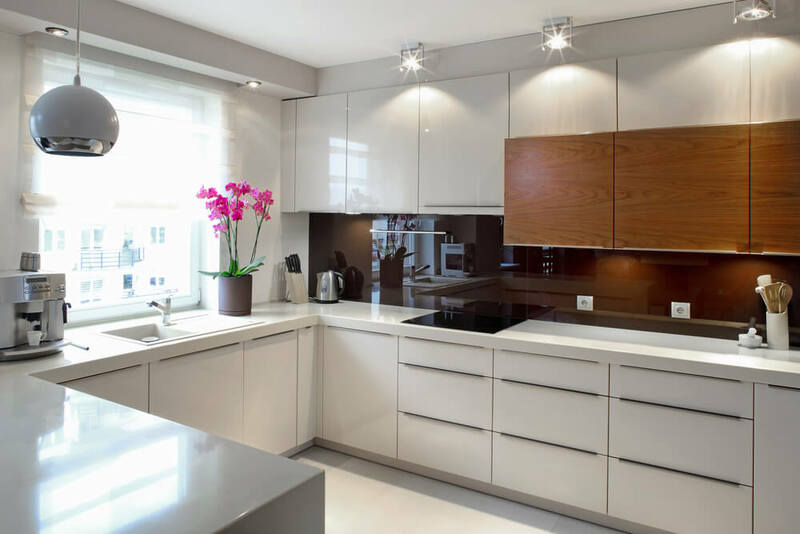 This kitchen is designed with a mix of dark wood and painted white cabinetry. The two tone design adds an unique style to this small, modern kitchen. Designed with classic materials such as butcher block and white Subway tiles, this feels much larger than it is. The u-shaped layout provides easy access to the sink and appliances. By using a monochromatic color scheme, this space is made to feel light and airy. 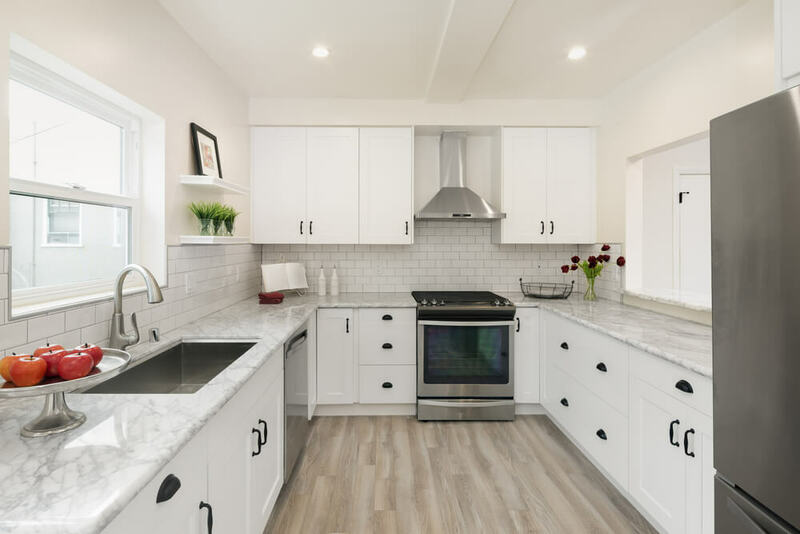 Crisp, white countertops and tile contribute to this aesthetic. This kitchen is designed to take advantage of the available windows by installing horizontal cabinetry above. A wall of wood veneer cabinets adds lots of storage space and houses the built-in oven. 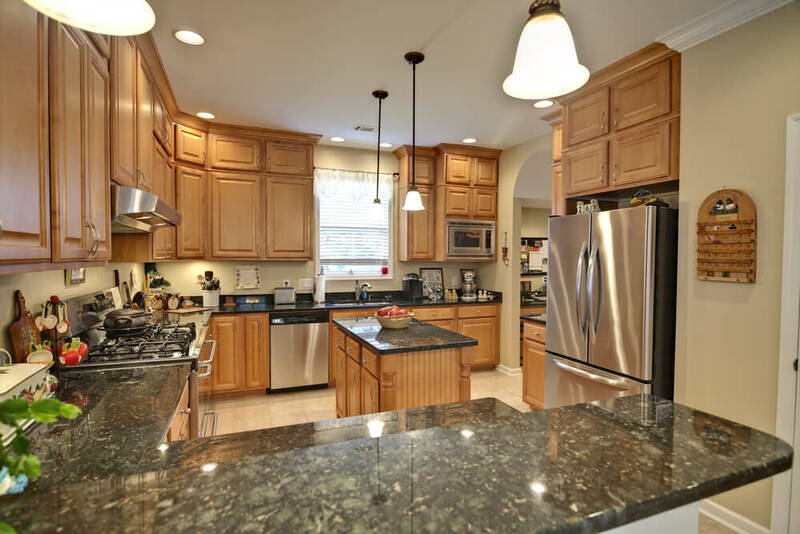 This spacious kitchen is features a u-shaped layout and large island/breakfast bar. 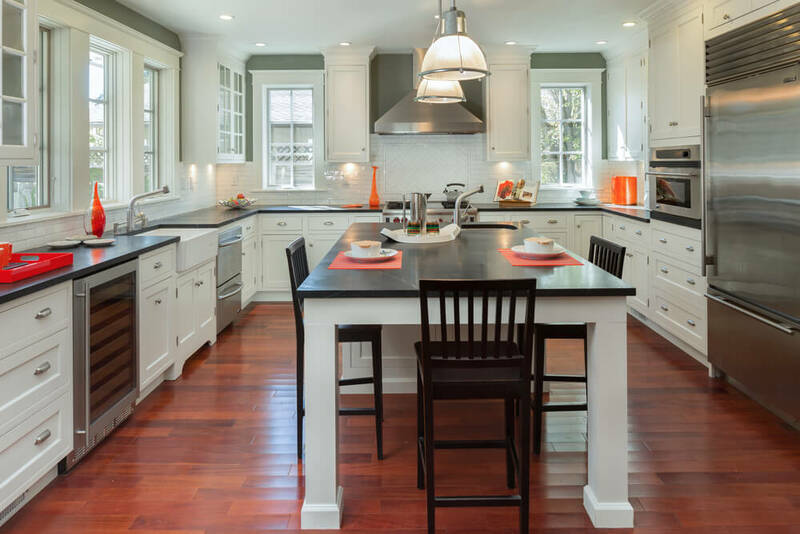 The dark wood floor provides a striking contrast against the white, Shaker-style cabinetry. 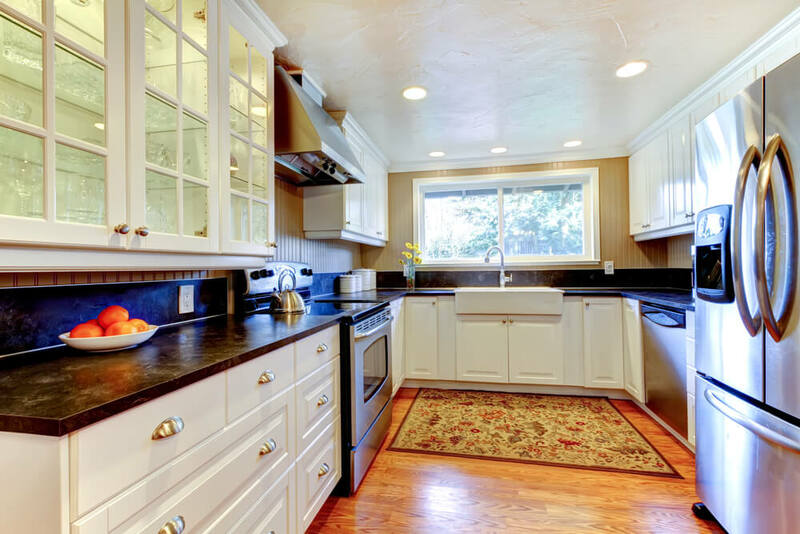 This kitchen features a simplistic design that provides maximum counter space and ample storage. A large window allows natural light to fill the space making meal preparation and cooking easier. This kitchen features a monochromatic, mosaic back splash and Shaker-style cabinetry. A long, slim island provides additional counter space and a space to visit and eat. 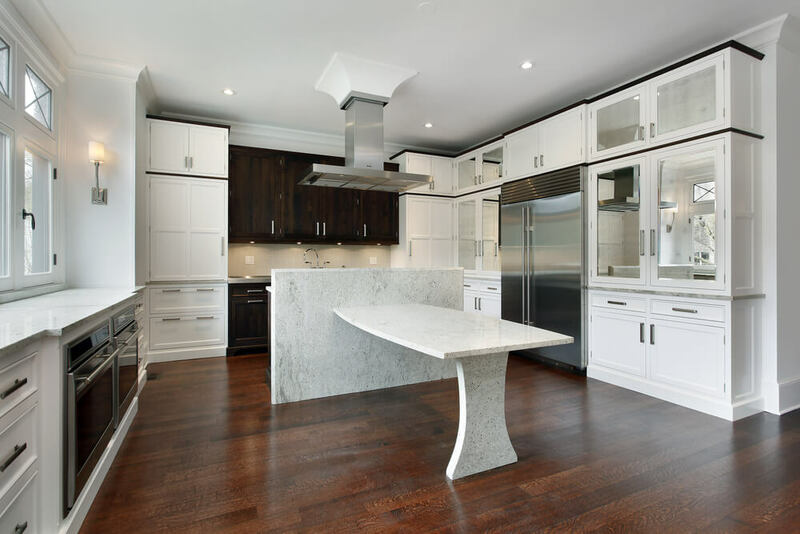 This substantial spaces houses a large, custom kitchen with rows of cabinetry and large runs of counterspace. 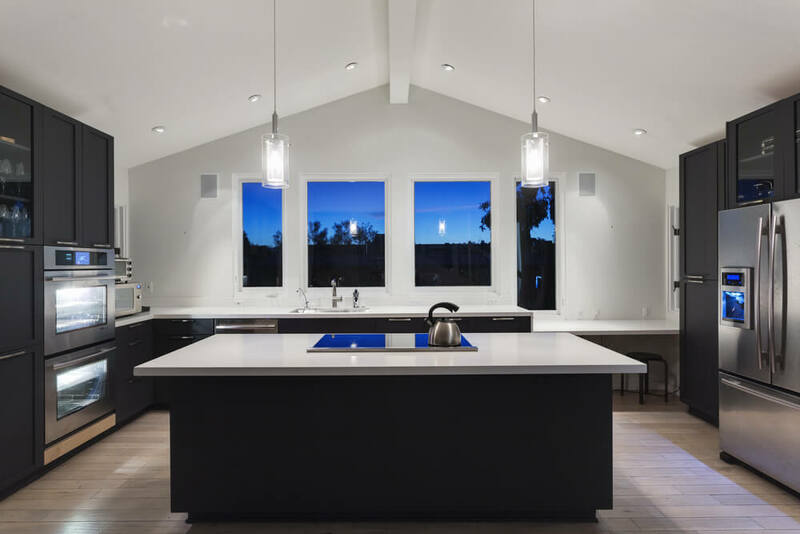 Three, translucent pendants hang above the island and provide additional lighting when needed. 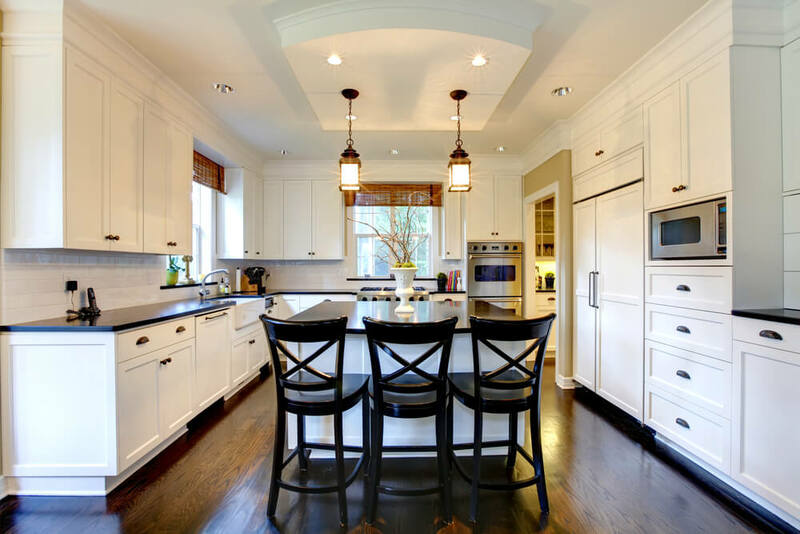 This kitchen features a custom, tray ceiling with inset lighting. The white cabinetry contrasts beautifully against the multi-toned counter tops. This modern kitchen features quartz counter tops and a subway tile back splash accented by dark gray grout. A deep sink provides ample space for washing dishes. This elegant country kitchen features a farmhouse sink and large island/breakfast bar. Two industrial pendant lights provide valuable task lighting for work around the island. 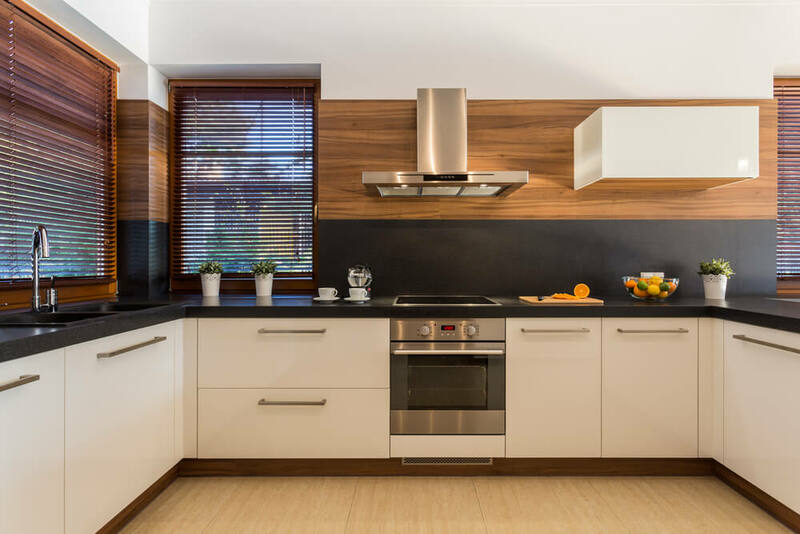 This modern kitchen is designed with minimal upper cabinetry and lots of counter space, The horizontal black/wood grain back splash accents the modern aesthetic of the space. The u-shaped design of this kitchen provides space for kitchen appliances, as well as a small peninsula for seating. A coordinating row of cabinetry acts as a buffet to store and display dishware and decorating accents. The soft, light-filtering blinds soften the hard lines of this modern kitchen. A breakfast bar is incorporated into the u-shaped design of the space, providing an outside view will enjoying a meal. 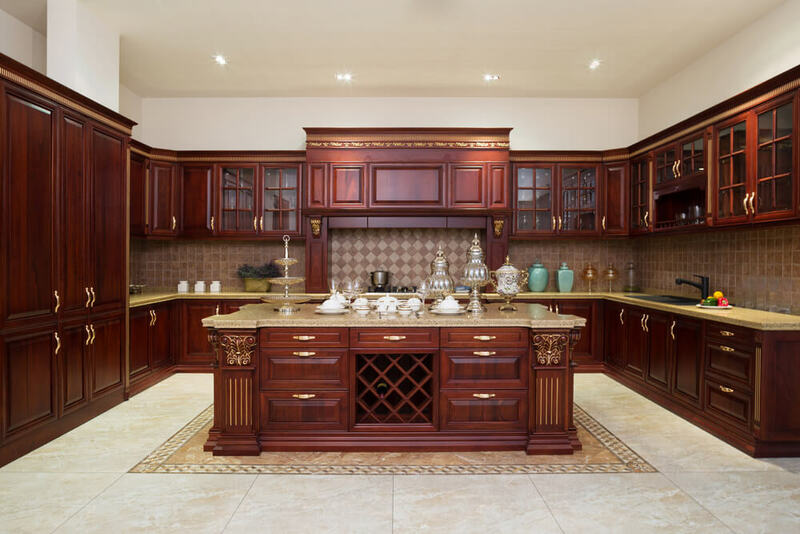 This custom kitchen features raised panel cabinetry accented by gold hardware. Glass front uppers provide a place to display antique china and decorative pieces. This kitchen features a green counter tops that reflect the foliage seen outside through the kitchen window. The island houses the kitchen cook top and provides additional work space. This spacious kitchen features wooden ceiling beams and skylights that fill the space with natural light. 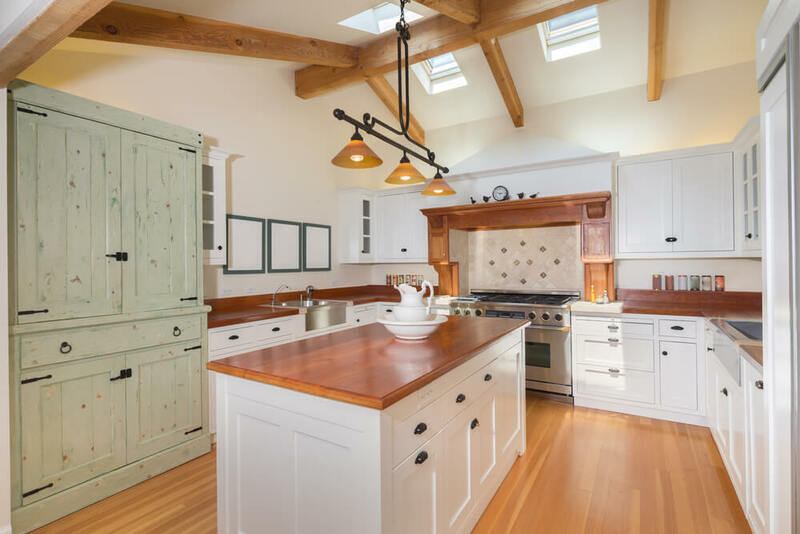 Shaker-style cabinetry and wood details create a inviting, country atmosphere. This u-shaped kitchen is designed with a pass-through to allow those working in the kitchen to be connected to the rest of the home. The marble counter tops and Subway tile back splash coordinate beautifully with the cabinetry to create an elegant kitchen design. This kitchen is designed to maximize on storage without feeling bulky and cluttered. Large windows, located just above the lower cabinetry, add the ethereal feel of the space. By installing stacked upper cabinetry this kitchen truly provides the most storage space available. The large island is designed to allow guests to sit at one end while the cook works on the rest of the solid stone surface. The color and style of this kitchen reflects a country design aesthetic. The vintage range acts as the statement of the space, fulfilling a decorative and functional purpose. 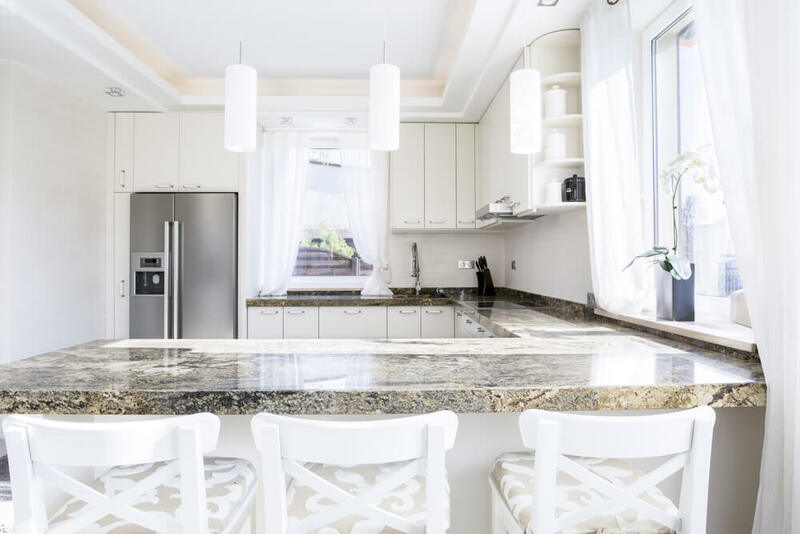 This unique kitchen features a counter-to-ceiling stone back splash. The layout of the space also provides long runs of counter space making it ideal for those preparing food and baking. This kitchen features a pass-through that allows those working in the kitchen to interact with people in the other rooms of the home. A large window located by the sink fills the space with warmth and light. 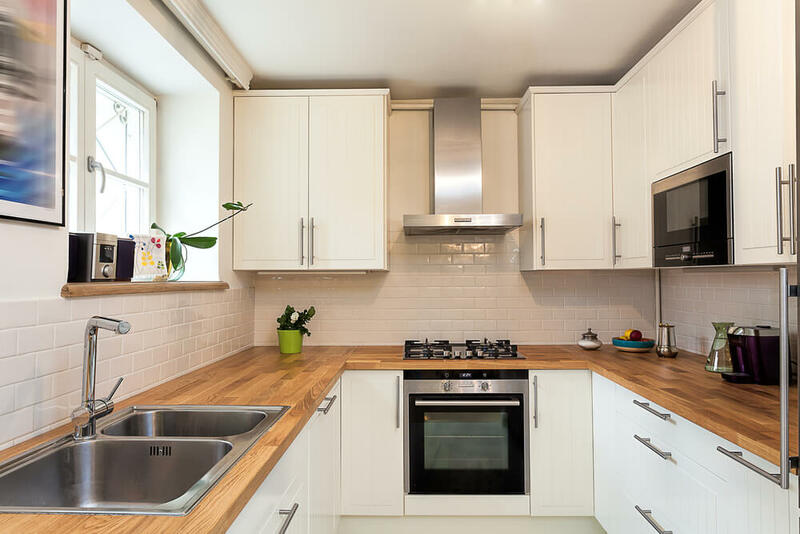 This kitchen is designed to make the most of the floor space available. Even a small wine rack is fitted into the space by the fridge to take advantage of every square inch. This kitchen features many custom features such as floor-to-ceiling cabinetry, double ovens and glass front cabinet doors. The space within the u-shape is large enough to accommodate a unique island/dining table. Oak hardwood floors provide an inviting foundation for this country kitchen. 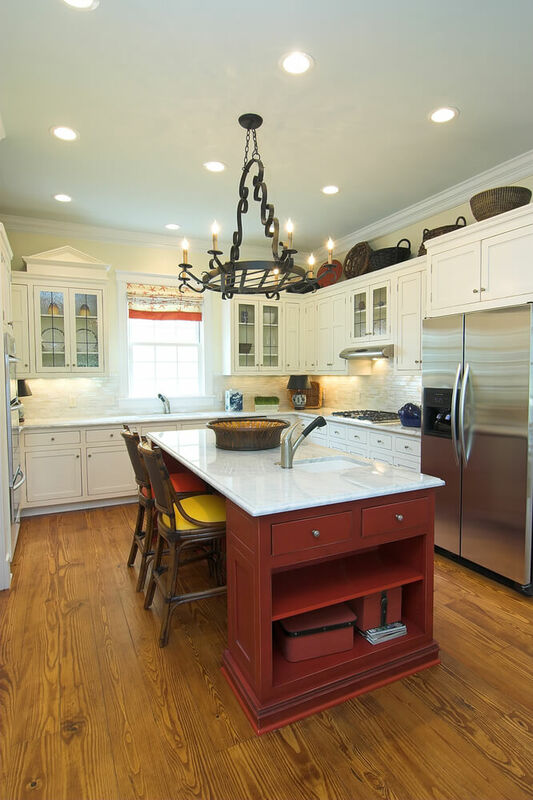 The red island provides a pop of color and features a solid marble counter top. 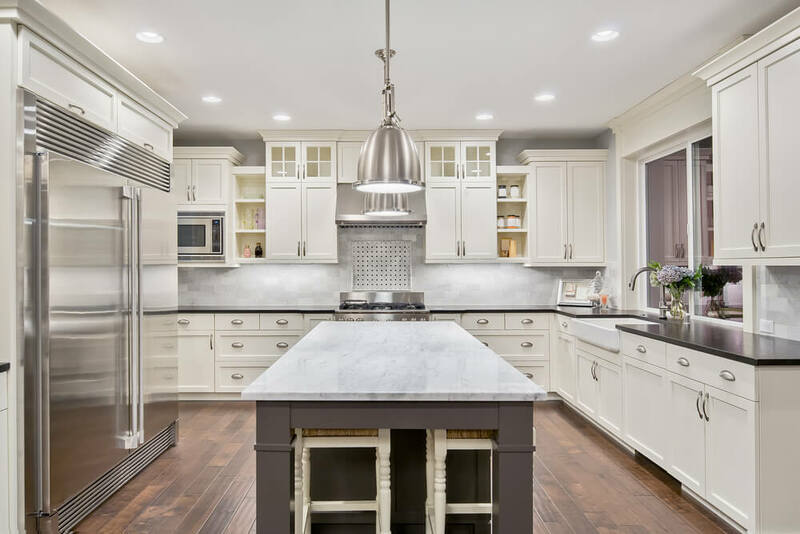 This elegant kitchen is decorated with many custom features including decorative supports, range alcove and coordinating cabinet doors for the fridge and dishwasher. This kitchen features a unique flooring design consisting of a perimeter of hardwood flooring with a tile inset. 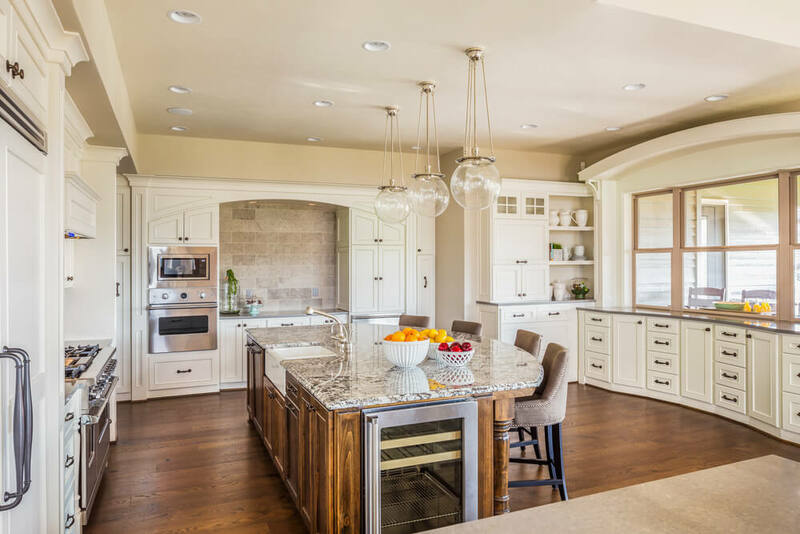 A curated island provides additional space for kitchen preparing and can act as a buffet as well.